GOT SPINACH? HAVE A SALAD! I can’t say enough about this salad! The recipe, from Lisa’s blog (Lisa is Cooking), originated from Donna Hay, the Australian writer who has incredibly beautiful cookbooks, with simple, elegant recipes. You can find the original recipe here; I’m giving you my own adapted version. Place the slices on a baking sheet, season with salt and pepper and spray them with olive oil. Place in a 420F oven until they get dark golden spots, turn them over and bake until crispy. Remove from the oven, allow them to cool slightly. Mix the sour cream, yogurt, lemon juice, and olive oil in a small bowl. Season with salt and pepper. 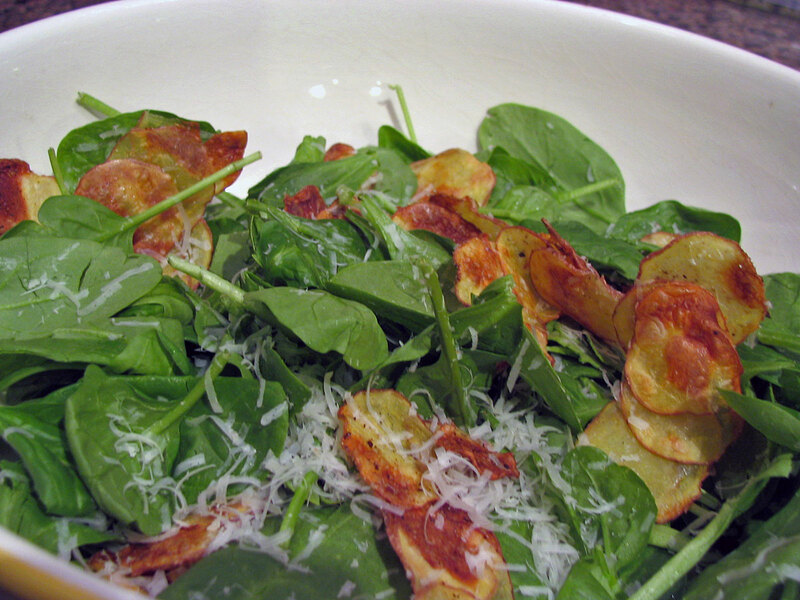 In a large serving bowl, mix the spinach with the potato slices and parmiggiano-cheese. Add the dressing right before serving. Comments: Don’t be too concerned with measurements, but make more than you think you’ll eat. 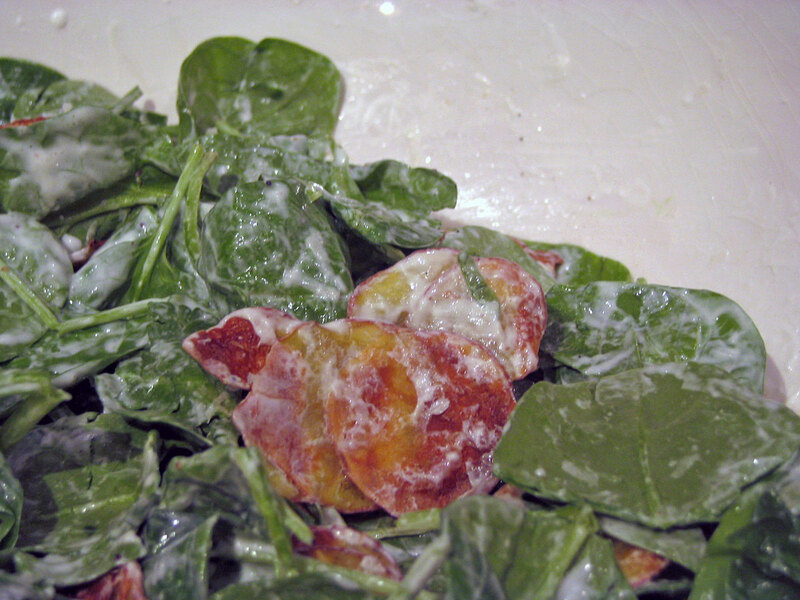 It will quickly disappear … I imagine that variations with different greens, like baby arugula or a mixture of greens, will also work well….Maybe with crumbled feta or gorgonzola cheese… A nice salad to serve at your next dinner party! Coloque as fatias sobre uma assadeira, tempere com sal e pimenta e espirre com azeite. Coloque em um forno bem quente até que estejam comecando a ficar bem douradas, vire as fatias e asse ate’ que fiquem crocantes. Retire do forno, deixe esfriar um pouco. Misture o iogurte, suco de limão e azeite de oliva em uma tigela pequena. Tempere com sal e pimenta. Misture o espinafre com as fatias de batata e o queijo na tigela em que for servir a salada. Adicione o molho na hora de servir.